How can you see Caravaggio like the late Renaissance Romans did? By seeing his work “in situ”, i.e. in the churches in Rome for which they were painted. Caravaggio, whose real name was Michelangelo Merisi (1571-1610), was born in a small farming community near Milan. He trained in Milan under Simone Peterzano, and made waves in Rome in the early 1600s with his dramatic chiaroscuro (or tenebrism), stark naturalism, and sometimes shockingly violent subject matter. 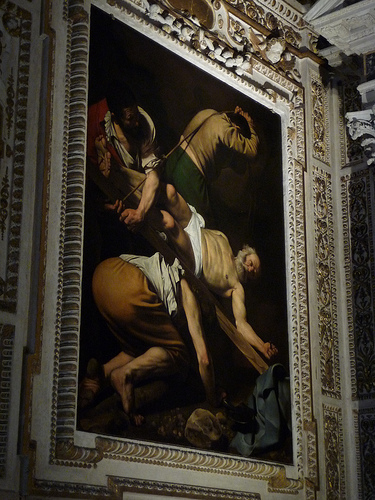 In this post I list churches in Rome in which you can visit Caravaggio paintings; I am only talking about those that can be visited in situ in Rome, rather than those available in museums like the Borghese. While museum lighting and display is great for close study of paintings, nothing beats seeing these works in their original location, as the artist intended, and as the Romans have seen them for centuries. These paintings were meant to stand their own in a chapel lit only by candles, so feel free to skip paying for lighting, and take the time for your eyes to adjust and your brain to take in their dramatic effect. This church has a Renaissance facade of travertine marble and an interior rennovated in the 17th and again in the 18th centuries. It houses works by numerous important artists, including the high altar by Bernini, and a cult-figure of the Madonna del Parto by Jacopo Sansovino (1516) on the entrance wall. 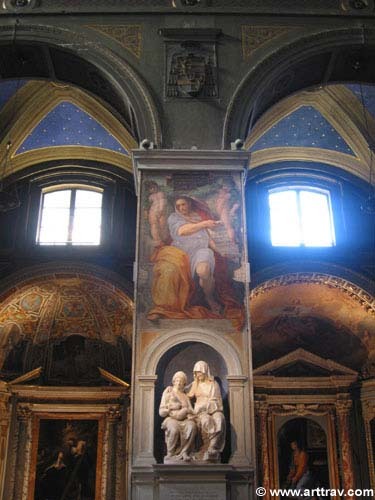 On the third pillar on the north side of the nave, there is a lone prophet by Raphael, restored by Daniele da Volterra. It shows how much the artist was influenced by Michelangelo. The figure is powerful and is a definate reference to the Sistine Chapel ceiling, though the style is Raphael’s own – less sculptural and cold, and more graceful. The garland-bearing putti that flank the prophet stand in casual contrapposto; they charm us with boyish looks in a style that is typical of Raphael’s treatment of this motif. 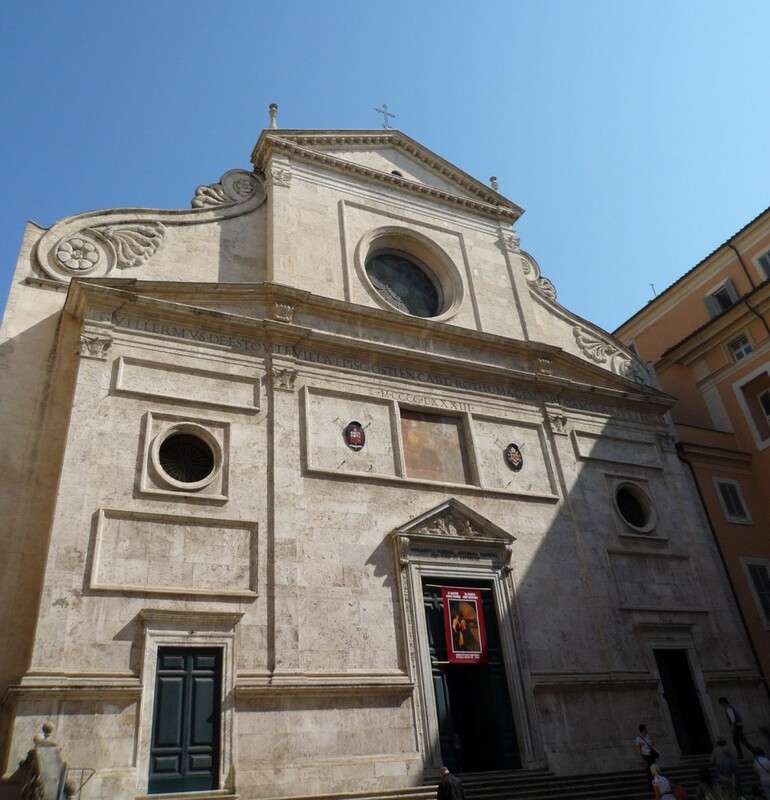 San Luigi dei Francesi is the church of the French community in Rome. It was begun in 1518 but work was interrupted, and only completed in 1589. The present aspect of the interior, and many of its fresco decorations, date to the 18th century. 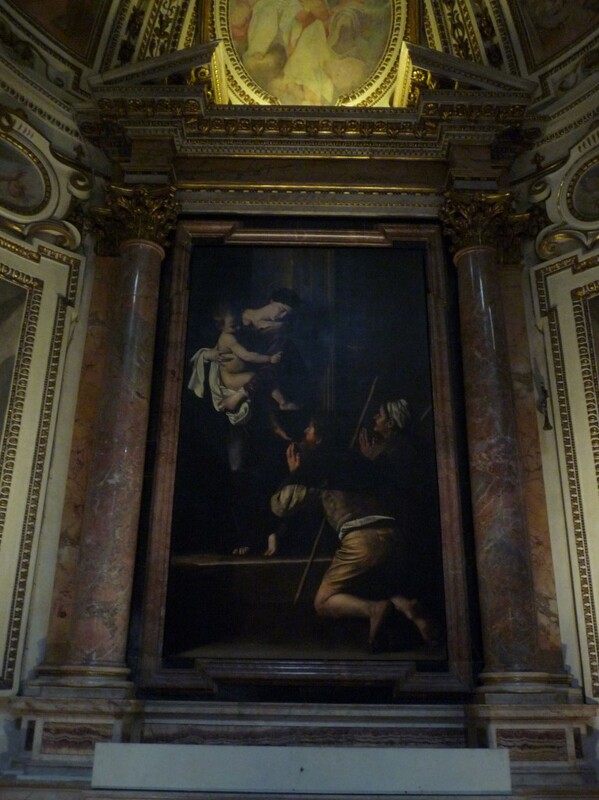 Caravaggio executed three canvases for the French Cardinal Cointrel’s family chapel, located in the left aisle of this church. 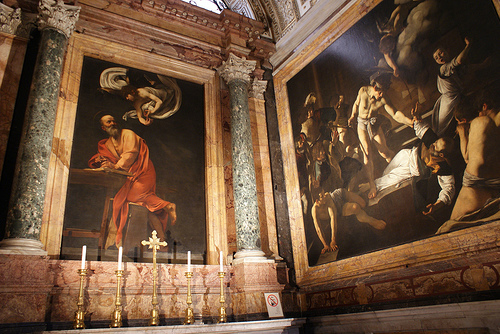 Over the altar is The Inspiration of Saint Matthew, on the left the Calling of Saint Matthew, and on the right the Martyrdom of Saint Matthew. The Inspiration, also known as “St. Matthew and the Angel”, shows the saint writing in a large codex when he is surprised by an angel who swoops in from above. You can see his surprise not only in his face, but also by how the bench on which he was balancing his knee is practically toppling out of the picture plane, knocked over as the protagonist jumped up. This is the second version of this painting; the first version was rejected by the patrons as the angel was shown physically guiding the saint’s hand, rather than suggesting ideas by enumerating them on his fingers. A dramatic three-dimensionality is achieved in these paintings by the artist’s practise of lighting his studio models from above with a harsh light in a dark room. The two paintings on the side walls are lit in a consistent manner that takes into consideration their display in the chapel and acts metaphorically to represent divine will. This chapel (at the far end of the church) houses The Crucifixion of Saint Peter and The Conversion of Saint Paul on the Way to Damascus by Caravaggio; the central panel that depicts the Assumption of the Virgin is by Annibale Caracci. Although you will see lots of people moving from one far side to the other in order to look at each canvas (which you can do to see details), it’s important to also look at the whole effect from a central point of view — even from the entrance step to the chapel, which is the point from which most viewers (except the patrons) would have seen a work in a closed private chapel. Stepping back, you can best admire Caravaggio’s innovative use of perspective and lighting that renders the images comprehensible even from an extreme angle. Enter your email address to conveniently receive new posts by email. Alexandra Korey aka ArtTrav is a Florence-based art historian and arts marketing consultant. Hi, I'm Alexandra Korey and my goal is to make art accessible. I'm from Toronto, Canada, but live in Florence, and I put my PhD in art history to use in arts marketing, blogging and social media. ArtTrav, a blog about expat life, art and travel in Italy and Europe, has been online since 2004. Want to know more?